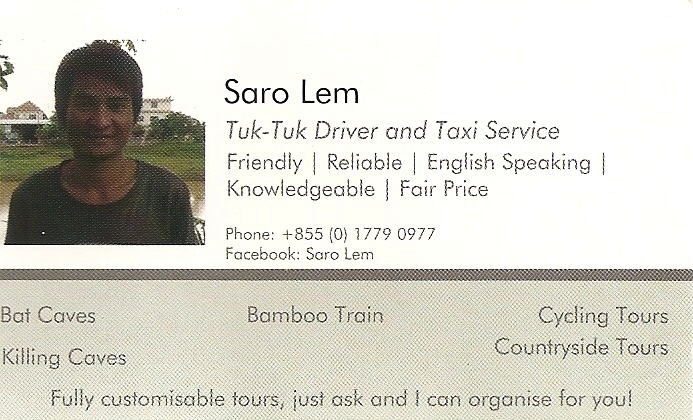 Andre's Fortress: Saro Lem, Hero of Battambang ! The humble tour guide with excellent English and tour guide skills. 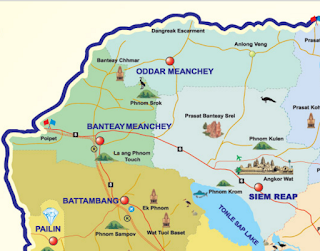 If you ever feel like straying away from the somewhat touristy Siem Reap (not that touristy is always a bad thing - Siem Reap is quite nice in itself as the town capitalises on its famous Angkor temples), look no further than Battambang, Cambodia which is a 2 - 2.5 hour drive from Siem Reap (depending on the skill of your taxi driver). Now, Saro Lem is something of a legend in these parts (in my view). He can provide a custom tour of Battambang and its surrounds. From memory..we were at Battambang on 30 December 2015. We flew back to Ho Chi Minh City on 31 December 2015. - Recommended a place for us to have lunch. 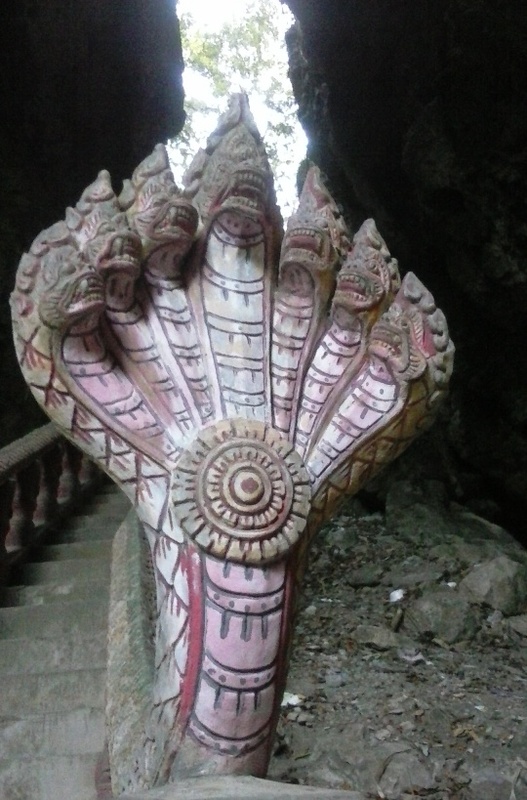 - Showed us the statue of Battambang and explained the history of it. 'Battambang' apparently means *the City of the Lost Stick. That's why the guy in the picture looks so bewildered and open-eyed because he lost his stick which I think was the source of his right to rule (perhaps my picture is too small for you to see his expression). - Showed us local villages and crops. The above photo I think is a chilli, peanut (? or potato?) and some other crop next to a river used for fishing. The villages were quite run down and poor :( We also got to see a rice workshop where they sifted and separated the rice into broken, whole and other sorts of rice which I forget the name of. There are plenty of temples too every now and then to stop by if you want to. - BAMBOO TRAIN! (but wear a face mask if sitting at the front - the insects don't fly into you, YOU fly into them). A 'dismantable' train along an unused train track that apparently can take you to...was it Thailand? (I forgot) if you keep going. It is essentially a wooden platform on 2 or 4 wheels propelled by a boat-like motor? It rides at about 30 to 40km/hr and there is nothing much to hold on to. 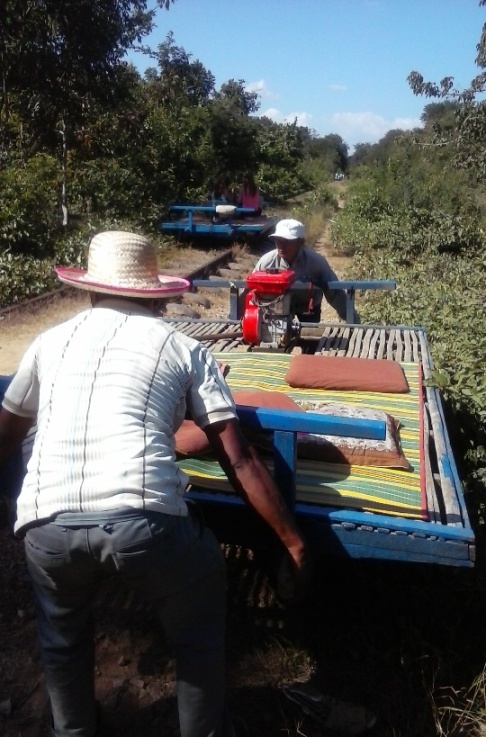 If a bamboo train comes from the other direction you have to hop off and your 'conductor' will dismantle the train. Very fun, I enjoyed this but I wish I had a face mask. HOWEVER I should say that the Smart Traveller website warns Australians not to go on bamboo trains LOL (I only read the website after we did it). Saro Lem on the right! - Went with us up a mountain to visit the Killing Caves (that evil place where they killed so many innocent Cambodians under the reign of Pol Pot by throwing them down a DEEP hole - the Killing Fields and Killing Dam [which Saro says is now a tourist resort?!?!] make up the other places of evil. Horrible. ), a temple and to view the local surrounds. - Took us after the sunset to see the bat cave where all the bats come out like crazy!!! 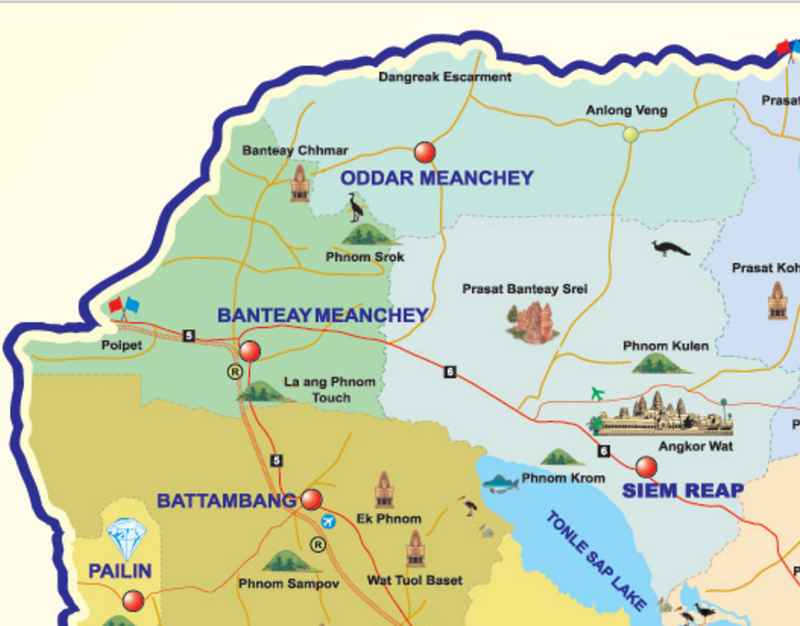 Note that the drive itself to Battambang will also enable you to see the countryside and have a better understanding of the 'real Cambodia' (though I am sure driving generally away from the main cities will show you this). So, if you are in town, please call Saro Lem to obtain his services on +855 (0) 1779 0977 or find him on Facebook. By doing this, you are supporting him, his wife and young child (both of whom we also met). His wife also helps to run a drinks shop. From our experience, he is quite a nice guy and refused to give us his business card until after the trip when he was satisfied that we were happy with his services. He was born and grew up in a refugee camp near Thailand. How he speaks English so well I will never know. Very admirable. I'd like to see him again one day. Full credit to my sister, Chloe, and dad for organising the trip. I planned absolutely nothing. looks like an awesome trip bro! He mentioned that he studied English at school, that's why his English was so good. not a drink shop.... a drink stall. Bamboo train is a good experience. If i do it again, I'll make sure I'll get myself a face mask or better a full face helmet!